Passed away peacefully on 1st April 2019. Beloved husband of Rosalyn. Loving father of Deidre, Neil and Ian. Grandfather of 7 and great grandfather of 1. To the world you may be one but to us you were the world. The Funeral Cortege for Mr Kenneth Costley of Cervantes will arrive at PINNAROO Valley Memorial Park, Whitfords Avenue, Padbury at 2:30pm on WEDNESDAY (10.04.2019) for a Cremation Service. Family wish for people to wear their checkered flannelette shirts. 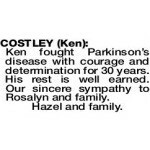 Ken fought Parkinson's disease with courage and determination for 30 years. His rest is well earned. Our sincere sympathy to Rosalyn and family. A good friend for 60 years. 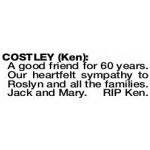 Our heartfelt sympathy to Roslyn and all the families. Jack and Mary. 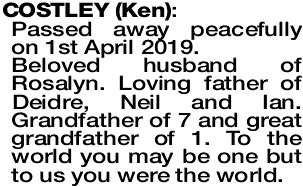 RIP Ken. 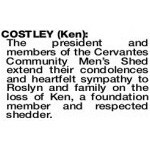 The president and members of the Cervantes Community Men's Shed extend their condolences and heartfelt sympathy to Roslyn and family on the loss of Ken, a foundation member and respected shedder.